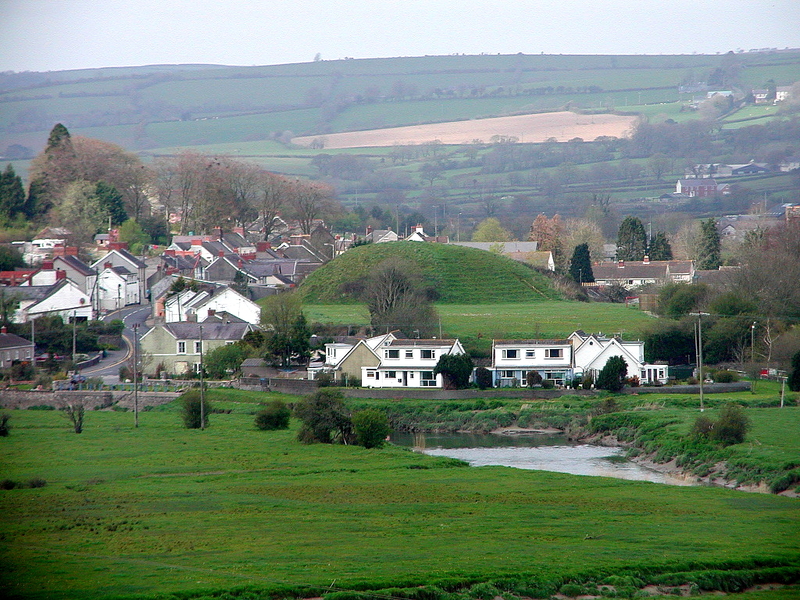 Above: the motte and bailey castle at St Clears, Carmarthenshire, Wales. 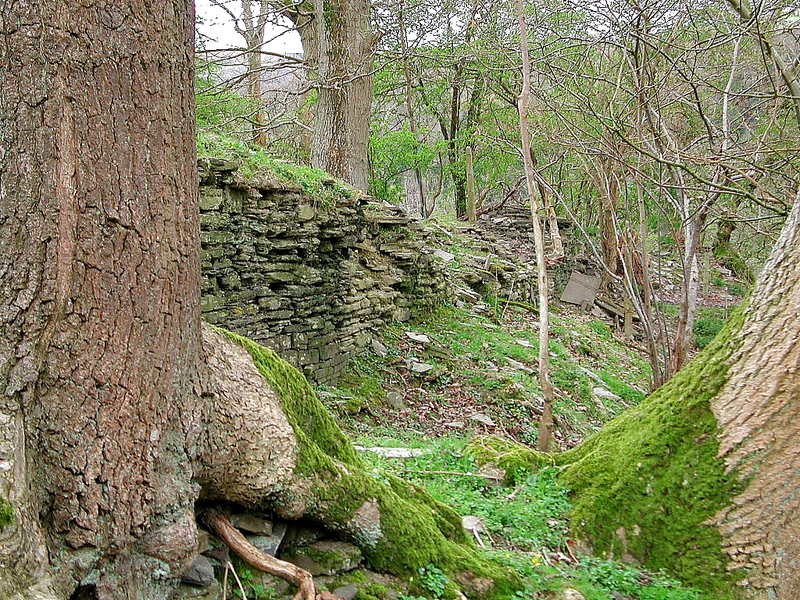 Below: the ruined curtain wall at Aberedw II, Powys, Wales. There is no doubt that some of the world’s finest medieval castles are found in Wales. Indeed, Conwy, Harlech, Beaumaris, and Caernarfon castles have all been declared UNESCO World Heritage Sites, while the likes of Caerphilly and Chepstow have long been recognized as important and influential examples of the art of medieval castle building. These castles and others in Wales have at least one thing in common - although they are technically "ruined", they are all basically intact. In other words, their main fabric has survived to the present. That means that towers, halls and other rooms can be seen and explored, and therefore appreciated by the modern visitor. Other Welsh castles are not so fortunate, and there are several reasons why these castles have disappeared from the landscape. First, many medieval castles were never fortified in stone, and none of these so-called earth and timber castles that dominated Britain for a century and half have survived. The reason is simple; stone lasts - wood does not. Nevertheless, impressive earthworks survive at many of these vanished sites. Another reason castles have disappeared is because of neglect and purposeful destruction. As the Middle Ages drew to a close, castles were largely abandoned in favor of more comfortable residences. Afterwards many castles were used as convenient quarries for houses, churches, and even fences in nearby communities. Other castles suffered the indignation of being purposely "slighted" or destroyed following the Civil War in order to render them indefensible. Today these castles lack substantial masonry remains, however some of them played important parts in the history of medieval Wales and therefore deserve our attention. Fortunately many of these sites are found in areas of outstanding beauty, which, in my opinion, more than makes up for a lack of standing ruins. Remember, a castle experience is not always about stone and mortar; location is important too. I have assembled below a collection of these castles as a quick reference guide. Each short entry provides a link to that castle's main page where you'll find additional information and photographs. The entries here are limited to castles for which we have at least one or two decent photographs of the site. Additional castles will be added as new photographs become available. Enjoy! There are two castles at Aberedw. The first is a motte castle near the village church that was likely raised by the Normans in the late 11th century, but was taken by the Welsh shortly after. The motte and ditch survive. The castle and church are both associated with the last days of Llywelyn ap Gruffydd (the last). The second castle at Aberedw is small enclosure masonry castle commissioned in 1284. Fragments of this castle's towers and curtain wall can still be seen today. This was a mote castle, probably originating from the 12th century. A shell enclosure was constructed at a later date, and the remaining fragments of stonework down the slope of the motte suggest that there was probably a wall connecting the shell to a curtain round the bailey. Fragments can be seen near the Castle Hotel. Builth was once one of mid-Wales most impressive castles. The original motte and bailey dates from the 12th century, although the castle was completely rebuilt by King Edward I in the late 13th century. This ambitious building program transformed Builth into a fortress that rivaled the great Edwardian castles of north Wales. Unfortunately in later centuries the castle was robbed of its stone. What remains today are the tall motte and an impressive network of ditches, banks and moats. Castell Cardochan is a ruined mediaeval Welsh castle of the same vintage and design as Castell-y-Bere in the Dysynni valley. Among the ruins can be discerned a typically D-shaped southern tower, a northern round tower, and rectangular central buildings. It was probably built by Llywelyn ap Iorwerth on its impressive igneous crag about two miles west of Llanuwchllyn. There are two castles on the high ridge at Cefnllys. The first was built by the young Roger Mortimer on behalf of his father Ralph between 1240 and 1245 (Rmefry). This castle suffered in the disputes between the Mortimers and Llywelyn the Last, pronce of Wales. A new castle was built on the opposite end of the ridge circa 1274. This castle too was eventually destroyed. Earthworks of both castles can be seen today. South of a housing estate in a natural hillock which as been made into a large mound up to 40m across on the top with a surrounding ditch. There are buried footings of a polygonal curtain wall probably with a keep or gatehouse on the south side and internal buildings. The castle may have been founded as early as the 1070s as a twin to Hay-on-Wye across the river. Clyro was amongst the several castles fortified in 1403 against Owain Glyndwr but probably soon fell into decay afterwards (Salter). Crickadarn is a D-shaped ringwork castle lying just west of the church in the village of the same name. The ringwork is surrounded by a ditch except towards the main ridge where it appears to have been filled in (Salter). The ringwork ditch is supplemented by a counterscarp on all sides except to the north where the fall is slightly greater (Remfry). Possible round tower have been found in the northwest corner of the platform. Although there a fair amount of rubble in the ringwork ditch, there is no real evidence of masonry fortification at the site (Remfry). Crug Eryr is a minor motte and bailey castle built on a commanding hill in Radnorshire. Although still prominent on the landscape, the castle and surrounding earthworks appear to have been altered and damaged over the years, making it somewhat difficult to ascertain the site's original form. The castle's present form consists of a D-shaped bailey platform rising above a surrounding ditch, adjoining a motte that is protected by its own ditch. This once substantial masonry castle is the highest-sited castle in all of Britain. Today the ruins consist of the northern gatehouse, low sections of the castle's curtain wall, along with other collapsed buildings and halls that are now buried and turfed over. The site is still dominated by its series of banks and ditches. This was a Norman castle probably dating to the late 11th century. This small but well-preserved motte is 3m high with a summit of 20m across lying close to Saint Mary’s church on the western edge of the town of Hay-on-Wye. The site overlooks a gorge and small stream leading to the Wye. A recently-levelled platform to the northeast may have once been the castle bailey. (Remfry). The castle was perhaps the seat for the manor of Melinog and was likely held independently from the nearby masonry castle, the two castles probably being occupied simultaneously (Salter). It is also possible that the motte and Hay is somehow related to the similar motte and bailey found at nearby Clyro. Hen Domen (Old Montgomery) is an important motte and bailey castle built by Roger of Montgomery in the late 11th century. The castle, although never fortified in stone, was once an impressive structure and an important outpost on the unsettled Welsh border. Today the castle’s impressive motte survives along with a complex network of protective banks and ditches. Hen Domen was recently the subject of an extensive archaeological excavation, the results of which have greatly aided historians in their understanding of earth and timber castles. It was eventually replaced by the masonry castle of Montgomery nearby. Holt Castle, known as Chastellion or Castrum Leonis from the lion sculpture above its gateway, was built some time between 1282 and 1311 by John de Warren, who was granted the area after Edward I's final defeat of the Welsh. The visible remains are difficult to interpret since almost all the stonework was removed between 1675 and 1683 for the construction of Eaton Hall, about 5 miles downstream. A survey of 1562 shows all the towers as round with a rectangular external annexe containing the chapel running full height of the south-eastern tower opposite the gate as square or rectangular. An imposing motte with a well-preserved horseshoe-shaped bailey earthworks. There is a modern house in the bailey. The castle is referred to in 1203, 1208 and 1209 as being captured during the Welsh-English struggles. It may be viewed from the road and from a public footpath. A brief account of the history of the castle is given in the 'Brut Y Tywysogion' (Red Book of Hergest Version) for the years 1200-1208. Local tradition has it that a nearby farmhouse called Glansawdde is built from stone taken from the old castle. A prominent Motte with defensive ditch lying next to a farm. The site has been fenced off for many years. The edges of the ditch are worn but still visible. There are one or two old established trees on the mound. In the grounds of a house above the church are the overgrown fragments of a castle probably built by Sir Ralph Monthermer in the second half of the 13th century, on the site perhaps used in the 12th century by Payn Fitz-John. In the late 14th century the castle passed to the Montacutes. It went to the crown after the execution of Margaret, wife of Sir Richard Pole, in 1541, and was sold to Edward Woodward in 1610. He in turn sold it to Rhys Kemeys. Parts of two round towers, a gatehouse and additions of the Tudor period are said to remain but little can now be recognized. An early motte castle here is believed to have received a polygonal shell enclosure in the 12th century. Only fragments remain. An earthwork enclosure (castle) with an additional bailey, the remains of which are near the church. A cylindrical tower was erected on a low platform in the enclosure, probably in the 13th century, and the enclosure was surrounded by a stone curtain. Now only some remnants of stone walls and the moat surrounding the motte remain, all on private land at Castle Weir Farm. If you go along the public footpath through a wooden gate to the east of the church, you can see a part of the castle moat, safely fenced off, above you and to the left." In the early part of the 13th century this site was used as a retreat by Morgan ap Hywell after he had lost his main stronghold of Caerleon to the Normans. The bailey is about 60m square. Although once protected by a wall and ditch it was poorly defended and is overlooked by higher ground to the north. The southern side is a cliff edge from which rises two tree-clad knobs of rock which bear the last traces of a round tower keep and a rectangular hall block, which were separated from each other and the bailey by ditches. Castell Morgraig north of Cardiff has been something of a bone of contention between historians as to who built the castle. Cadw and others favor the notion that the castle was built by the Normans, while local historians point out the castle's similarities to others built by the native princes of Wales. The motte at New Radnor still towers over the village below. It is likely that the first castle on this impressive defensive site was built by the Normans in the late 11th century. New Radnor was captured by the Welsh and rebuilt several times before being left to decay following the Glyndwr rebellion in the early 15th century. Today the castle is reduced to its motte, a series of banks and ditches, and sections of a wall that once encircled the town, but these are nevertheless an impressive set of remains. This is probably the most impressive set of earthwork remains in all of Wales. The castle is named after its builder Pain Fitz-John and was destroyed and rebuilt several times. The castle was rebuilt in stone by Henry III in 1231 with a round tower keep on the motte and curtain wall with an east gatehouse and several D-shaped flanking towers. Today site is dominated by the castle's large motte and series of tall, deep banks and ditches. All the remaining masonry has collapsed and is turfed over. The overgrown ruins of Penmark Castle lie in an orchard behind the church of St Mary's in Penmark, Vale of Glamorgan (formerly south Glamorgan). The castle once belonged to the Umfraville family, and today the principal remains consist of a section of curtain wall connected to a round tower and rectangular latrine turret. A small motte and bailey castle defends the crossing of the Pulford Brook, at this point the border between England and Wales, on the road from Wrexham to Chester. Pulford castle is stratgically sited as an outpost of Chester castle protecting the road at a major river crossing, though modern drainage has made the river and the river marshes look a lot less formidable today (The name Pulford is derived from pwll-marsh and ffordd-crossing). It is one of three small timber castles guarding the border in the area, the others being Dodleston a kilometer NW and the large motte at Aldford, protecting a crossing of the River Dee, a kilometer East. At Richard’s Castle a plate found near the site states, "The Castle, one of only three eleventh century wooden mottes existing in England before the Norman Conquest - built by Richard Fitzscrob who gave his name to the parish. Rebuilt in stone, the Castle had its heyday in the 13th and 14th centuries, when it was the stronghold of the Mortimers and Talbots. By 1530, it was part of a farm and largely in ruins." The castle, known locally as Banc y Beili, was a Norman stronghold probably founded circa 1100. Although there are indications that a stone tower at one time crowned the summit of the motte, St Clears was primarily an earth and timber castle. Today, the impressive motte at St Clears still dominates the village and surrounding countryside. The motte and bailey sits in a well-kept park right off the main road. The motte is maintained so that undergrowth and vegetation is kept in check. A children's playground occupies a portion of the large bailey, which is otherwise kept clear and accessible. If you’ve ever wanted to see a textbook example of a Norman motte and bailey, the castle at St Clears more than fits the bill. Hidden among the bushes and trees are the remains of a castle built by Roger Bigod III, earl of Norfolk, as a hunting lodge. It is mentioned in 1305, as a newly built tower was probably left incomplete at his death in 1306. At each southern corner are remains of towers with octagonal interiors up to 6m in diameter.